Good afternoon, everyone. For the second year in succession we have been lucky enough to reach the third round proper of the FA Cup, and for the second year in succession we have been equally fortunate with the draw. Last year we took on, and gave a real fright to, a team at the top of the second division but now we have every non-league’s club ambition – a home tie against a top class first division outfit. To the players, officials and supporters of Coventry City FC we offer the warmest of welcomes, and we hope you enjoy your brief stay with us and sample the hospitality for which non-league football is renowned. As we said at the time of the draw, when one considers the headaches we might have been caused by a home tie with one of the so-called ‘top five’ glamour clubs, a pairing with Coventry provided an almost perfect match for us. Along with Norwich and Millwall, Coventry have played their part in shattering the illusions of those ‘glamour’ clubs whose actions in some aspects of the game in recent years have given the impression that they possess a divine right to be championship challengers. After a setback at Everton, Monday’s thrashing of Sheffield Wednesday will have boosted confidence at Highfield Road, as well as lifting them back above Everton into fourth place, and it is sad that, with English clubs still barred from Europe, a club can only gain real recognition in the Football League these days by actually winning it! However, Coventry’s most famous moment in recent years was their dramatic FA Cup final success over Spurs two years ago, generally regarded as the finest final of the 1980s, and those players involved in that game will need no incentive to aim for success today, and possibly a return visit to the ‘twin towers’. As Middlesbrough found out last season here, though, and as several other clubs have found to their cost in recent years, non-league players also need little incentive to raise their game on an occasion such as this, with the probability of an audience of several million higher than they are used to. It promises to be an intriguing battle, and let us hope it will fulfil the best traditions of ‘David v Goliath’ in the FA Cup. We must at this point place on record our appreciation of the efforts of everyone who has helped us stage this game today. Bearing in mind we have had a week less than last year to organise things, and there has also been a New Year’s holiday much more awkwardly placed than last year, lots of people have had to move fairly fast to enable the ground to reach the required standard, and to make the arrangements to accommodate an 8,000 crowd. We are grateful for everyone’s cooperation, and we hope the game provides a suitable reward for the endeavour. Also we would like to welcome all our guests, our main sponsor Reed Business Publishing and our match sponsors, Allder’s of Sutton, as well as representatives of the media, television and radio who are with us this afternoon – in the media’s case mostly for the first time. Again, we hope that you enjoy your afternoon with us. Our line-up, at the time of writing, seemed to have a few question marks against it, but both Tony Rains and Stuart Hemsley hope to have shaken off the knee injuries they picked up during our slightly disappointing holiday programme, while Matthew Hanlan’s appearance on Monday confirmed a speedy recovery from the stomach upset which forced gis withdrawal at Aylesbury. It should be said, though, that in Tony and Stuart’s absence against Maidstone, Vernon Pratt and particularly Graham Morris, on his home debut, performed most impressively. Indeed the defence as a whole on Monday stood out – I douby whether Mark Gall has found a less obliging defence all season! Should today’s game require a replay please note that it will be on Wednesday night, January 11th, at Highfield Road, kick-off 7.30. The Supporter’s Club will take coach bookings after today’s game. Next Saturday we have a very important game here in the 1st round of the FA Trophy (in which we stand a much more reasonable chance of reaching Wembley) against Kingstonian. If you have enjoyed your afternoon with us today, please come back next week! 1. When Coventry won the FA Cup in 1987, who were their semi-final opponents, where was the match played, and why did it make history? 2. Under what unusual circumstances was Coventry’s Highfield Road ground used for an FA Cup third round tie in 1985? 3. What marathon ended at Coventry in 1980, and who scored the goal to end it? 4. Which other non-League sides reached the FA Cup third round last season, and which teams beat them? Founded in 1883, Coventry City were originally known as Singers FC, a name which they held for fifteen years during which they turned professional. In 1898 the current name was adopted and the following year they moved to their present ground at Highfield Road, having previously played at Binley Road and Stoke Road. Coventry’s early professional days were spent in the Southern League, but on the formation of a Football League second division in 1919 they were elected, and held their status until 1925 when they were relegated to Division Three North. The following year they transferred to the Southern section, where they spent ten years before pipping Luton Town by one point to gain promotion. A key factor in their success was the goalscoring ability of Clarrie Bourton, whose 171 goals between 1931 and 1937 remains a club record. Division Two was to remain Coventry’s level until after World War Two, but in 1952 they once more suffered relegation to Division Three South. Success this time was harder to come by, and in fact such was the club’s record in 1958 that they took their place in Division Four on its formation. Immediately they gained promotion as runners-up to Port Vale, and five years later returned to the second division with the Division Three championship under their belt. In 1967 came Coventry’s promotion to Division One along with Wolverhampton Wanderers. When the sides met at Highfield Road inside the last month of the season the attendance was 51,455, a ground record that is never likely to be broken as the stadium’s capacity is now down to 22,500 of which all but 2,000 is seated accommodation. Since their elevation to first division status, Coventry have rarely set the league scene alight, with a highest placing of sixth in 1970 leading to the club’s only appearance in Europe to date in the Fairs Cup. However, only three sides – Arsenal, Everton and Liverpool – from the current first division have held their status longer. Perhaps the club’s finest hour was in 1987, when they made their first ever visit to Wembley and beat Tottenham Hotspur 3-2 in arguably the best final of the 1980s. Under the management of George Curtis, who holds the club appearance record of 486 games between 1956 and 1970, and coach John Sillett they proved that success could still be achieved with a friendly and humorous approach to the game. Following that triumph Mr. Sillett became manager in charge of team affairs, while Mr. Curtis is now Coventry’s managing director. Steve Ogrizovic, goalkeeper; Age 31. Rated by many as one of the best uncapped ‘keepers in the Football League, he is in this fifth season at Coventry having been signed from Shrewsbury for £72,000. Has also played for Chesterfield and Liverpool, where he made five full appearances. Brian Borrows, defender: Age 28. In his fourth season with the club, he was signed from Bolton for £80,000 having begun his career with Everton. Unluckily missed City’s FA Cup Final win against Spurs through injury. Greg Downs, defender: Age 30. Experienced left-sided player signed in 1985 from Norwich. Has made a century of appearances for both clubs, and also one appearance on loan for Torquay. Steve Sedgley, midfield, Age 20. London-born player who has graduated through all the ranks at Coventry, making his debut in 1986. Capped three times by England at Under-21 level. Brian Kilcline, defender: Age 26. Powerful centre back who joined the club in 1984, having previously made over 150 appearances for Notts County, his home town club. Holds two England Under-21 caps. Trevor Peake, defender: Age 31. Cost a six-figure fee when signed from Lincoln in 1983, and has now made over 200 appearances for Coventry. Originally with Nuneaton, with whom he won two England semi-professional caps. Graham Rodger, defender: Age 21. Glasgow-born player in his fourth full season at Highfield Road. Began his career with Wolves, and has three England Under-21 caps. David Phillips, midfield: Age 25. Although born in West Germany, he is qualified to play for Wales and has been capped 20 times. Commanded a £150,000 fee when signed from Manchester City in 1986, having started his career with Plymouth Argyle. David Speedie, forward: Age 28. A £750,000 signing from Chelsea at the start of last season, having forged an impressive partnership with Kerry Dixon while at Stamford Bridge. Scored a hat trick in the 1986 Full Members’ Cup Final at Wembley, and holds five full Scottish caps. Has also played for Barnsley and Darlington. Cyrille Regis, forward: Age 30. Powerfully built striker who many feel should have won more than his five full England caps. Signed for £300,000 from West Brom four years ago, he began his career with Molesey before moving to Hayes, and has played on this ground for both those sides. Keith Houchen, forward: Age 28. Much-travelled striker whose finest moment was a spectacularly head goal in the 1987 FA Cup Final, but who may also be remembered for scoring York’s winning goal against Arsenal in 1985. Previous clubs include Hartlepool, Leyton Orient and Scunthorpe. David Smith, midfield: Age 20. Gloucester-born player who has been capped three times by England at Under-21 level. In his third season at Coventry, his only senior club. Gary Bannister, forward: Age 28. In his second spell at the club where he started his career, having enjoyed productive periods at Sheffield Wednesday and QPR in the meantime. Re-joined Coventry last March, having scored 72 goals in 172 games at Loftus Road. Keith Thompson, forward: Age 23. Like his elder brother Gary (now at Aston Villa) he came through the ranks at Highfield Road, but he then left to join Real Oviedo in Spain. Returned to Coventry in September, buying out his contract with Oviedo. Lloyd McGrath, midfield: Age 23. A member of the 1987 FA Cup winning side who is returning to fitness after breaking a leg against Ipswich in the Simod Cup last season. Dave Bennett, forward: Age 29. Another who was in the victorious Wembley side (scoring the first City goal) but who has had to recover from a broken leg. Recent impressive reserve performances may put him back in the reckoning today. Previously with Manchester City and Cardiff. Dean Emerson, midfield: Age 26. Signed in 1986 from Rotherham, he began his career with Stockport County, for whom he made over 150 appearances. As a number of you may well not be regular visitors to Gander Green Lane, here are some of the details about the Sutton United squad today. Trevor Roffey, goalkeeper: Age 23. 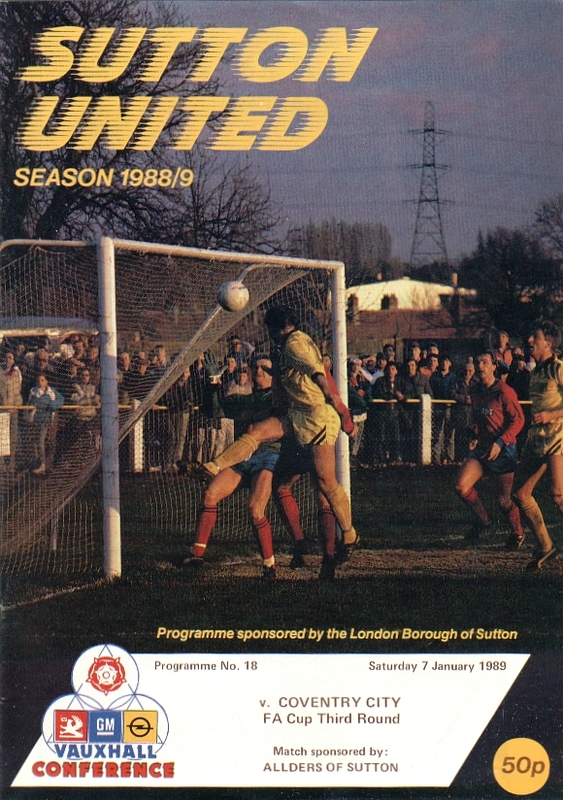 Rejoined Sutton at the start of last season after a spell at Tooting, and acquitted himself well having received his first team chance almost immediately. Suffered a broken ankle last March but has fully recovered. Son of Dave Roffey, who kept goal for us against Leeds in 1970. Robyn Jones, defender: Age 28. Making his third consecutive appearance in the third round, having played for Caernarfon in 1986-87. Joined us soon afterwards, and has now made over 100 appearances. Welsh-born, he has previously played for Rhyl and Runcorn. Tony Rains, defender: Age 27. Club captain who made his 600th appearance for Sutton in October. Originally in our youth team, he rejoined us on being released by Fulham ten years ago and has been a regular in the back four since. Has been granted a testimonial in 1989. Nigel Golley, defender: Age 27. Recently converted to centre-back having spent much of his career as a midfielder. Signed from Whyteleafe in 1982, he is the brother of Mark Golley who scored for us against Middlesbrough last season and who now plays for Maidstone. Stuart Hemsley, defender: Age 24. Our only major signing on gaining Conference status in 1986, he had previously made over 300 appearances for Croydon. His reliable performances earned him selection for Middlesex Wanderers last season. Paul Rogers, midfield: Age 23. A graduate of our youth team who began his career as a striker but has been successfully converted to a midfielder. Enjoyed an outstanding season last term, being voted ‘Player of the Year’ by the Supporters’ Club and earning selection for Middlesex Wanderes’ tour of Indonesia. Micky Stephens, midfield: Age 28. Long serving and immensely skilful player who graduated through youth and reserve ranks to the first team in 1977. Has now made over 500 appearances for Sutton and holds seven England semi-professional caps. Shares a testimonial this year with Tony Rains. Phil Dawson, midfield: Age 23. Hard-working player who came through our youth team and, like Paul Rogers, played for a spell with Chipstead. A little unlucky with injuries, but has over 150 appearances to his credit. Lenny Dennis, forward, Age 24: Singed from Dulwich in October in 1985, he has become a firm favourite with the U’s fans, recently scoring his 100th goal in only his 164th match. During the summer represented Jamaica in the World Cup qualifying competition for 1990. Paul McKinnon, forward: Age 30. Much travelled player originally signed by us from Woking as a midfielder in 1977. Has filled a variety of positions but in recent years has developed into a prolific goalscorer, with over 200 goals in nearly 400 games. Spent a period last year with Blackburn, and has played for Malmo, Tegs and Orebro in Sweden, and Ryoden in Hong Kong. Matthew Hanlan, forward: Age 22. Another product of our youth and reserve teams who made his senior debut two years ago and has now made over 80 appearances, either as a striker or a wide midfield player. Vernon Pratt, defender: Age 24. Signed from Camberley at the start of the season, a centre back who broke into the first team squad during his first season with us, and has a useful eye for goal. Justin Horner, midfield: Age 23. Close season signing from Woking who earned a first team chance in October. Possesses a powerful shot. John Kennedy, forward: Age 19. Promising attacking player signed during the summer from Swindon, who has enjoyed a highly successful season in our reserve side. Steve Turner, forward: Age 25. Joined us for £1,500 in the summer from Redhill, having impressed in an FA Cup tie here last season. Speedy striker who scored on his first full competitive outing in October at Dartford. Under normal circumstances we would not consider our modest talents to be the match for a highly placed First Division team, indeed the Cup winners of two years ago. But today we have earned the right to play against one of the country's top sides, and the door of possibility has opened just a crack allowing a shaft of sunlight to burst through. It would be unrealistic, however, that this third round tie is solely a result of this season's endeavour, to many of us it represents over ten years' hard work. In how many seasons, for example, have we come to grief in early rounds of the FA Cup against sides from lower leagues? Since our recent cup runs, however, it is quite possible that we can now look forward to some seasons of exemption from qualifying rounds. It might even be that we could gain exemption until the First Round proper in 1989-90, as Maidstone United did this year. Apparently the FA allocate a place in the First Round to the most successful non-league club in recent FA Cup competitions, and we may now fit into that category. And exemptions make giant-killing possible! A thought occurred to me, once the full impact of playing Coventry at home had settled, that it just might be that no non-league club had ever drawn a Football League club as highly placed as Coventry are now in the first division — they were third when the draw was made. Possibly it was Sutton when they drew Leeds. It still remains a singular honour and puts a fitting seal to the 'professional set' we have gathered over the last two seasons — one from each division. The opening quote could be taken to mean just the players, but that is not its intention. It seems totally appropriate and reflects not just the team's achievements, but the entire Club performance. We have been granted the increased capacity, and in order to put the game on, help and support has come from all quarters of the Club. To everyone involved, and on behalf of the players, could I express our thanks for giving them the opportunity to play such a team as Coventry on this ground. To have this match at Gander Green Lane represents our one chance to surprise the football world. Coventry are the favourites to win but "the everlasting team-work of every bloomin' soul" might, just might, pull it off. 1. Leeds United at Hillsborough; the first FA Cup semi final to be played on a Sunday. 2. Burton Albion played Leicester City ‘behind closed doors’ after crowd trouble had forced the original match at Derby to be halted. 3. Arsenal beat Liverpool 1-0 in a 3rd replay of their FA Cup semi-final; Brian Talbot scored the goal. 4. Bath City (lost to Mansfield), Macclesfield Town (Port Vale), Maidstone United (Sheffield United), Yeovil Town (QPR).